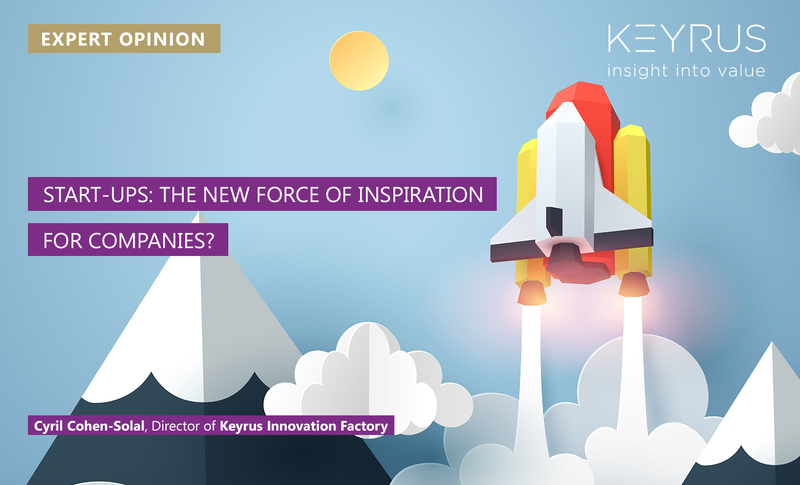 KEYRUS | Start-ups: the new force of inspiration for companies? Start-ups: the new force of inspiration for companies? Major companies are turning to start-ups to enhance and accelerate their capacity to innovate. But the rules of the game have changed: start-ups no longer want these mentors who protect them so as to then take them over more effectively. They want to be able to grow and work with established companies according to a "win-win" philosophy. • the fear that a challenger might wade into their market, just as Uber and Airbnb managed, within a very short space of time, to destabilize the taxi and hotel businesses by asserting themselves, through a simple application, as intermediaries and trusted third parties. Are the efforts of companies towards start-ups bearing fruit? 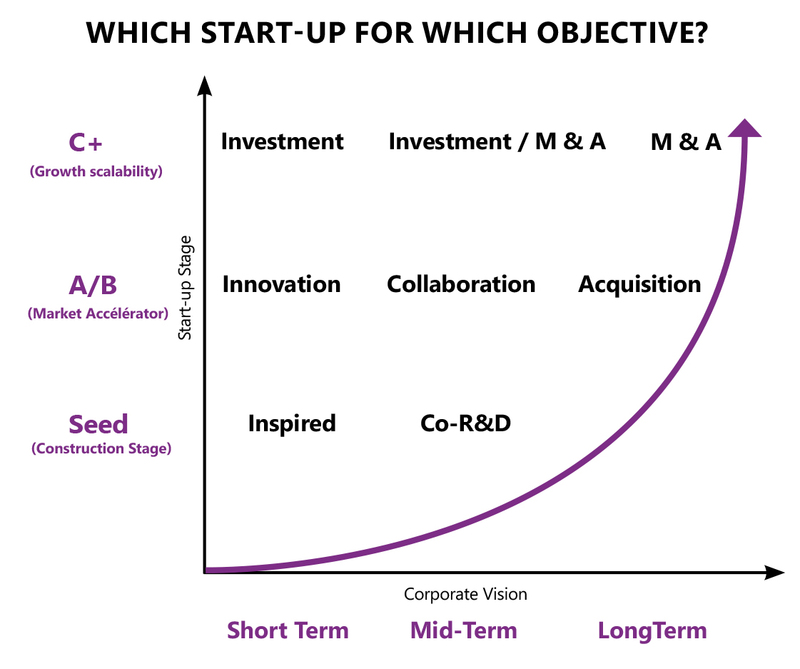 To answer this question, one has to consider the companies' objectives alongside those of the start-ups. It has to be admitted that these two sets of objectives are not entirely in line with each other. It has widely been said, especially in France, that the ambition of any creator of a start-up is to be bought out by a large group as quickly as possible. Recent studies, and what we are observing ourselves in the framework of the Keyrus Innovation Factory, show that this is absolutely not the case: both in France and internationally, the great majority of startups see their collaboration with companies above all as a means of gaining access to the market. This means that they are looking more for customers and partners than for a potential buyer or future shareholder. This is all the more true given that aid schemes and financing channels, notably the public ones, have become considerably more structured and diversified. In other words, when it comes to financing the early stages of one's start-up and then its growth, it is no longer essential to form part of the stable of a large group. That was a solution in return for which the start-up was required, either explicitly or tacitly, to relinquish its freedom to approach other players in the market. However, startups are looking to open doors for themselves, not close them. Whilst they do not shun schemes put in place by companies, they do not wish to be locked into them and miss out on other opportunities to put their economic model, technology or products to the test in their target markets. This structuring of the ecosystem, which has been particularly remarkable in France, also gives start-ups a greater possibility of uncoupling the development of their business from their search for funding, or for one form or another of "exit" (takeover or, more rarely, stock market listing). However, another effect of creating a more favorable ecosystem is that there is an explosion in the number of start-ups. They number more than 3,000 in the Île-de-France region alone. One should, of course, be pleased about this, but also recognize that, even for the most highly organized companies, this proliferation makes it harder to identify those start-ups with which they could work on a "win-win" basis. Moreover, whether it be to find the technology they lack, modernize their offering, or identify disruptive innovation at an early stage, companies must obviously look beyond their borders. Whilst the largest amongst them have the resources to extend their watch and selection processes to an international level, this is less often the case for intermediate-sized enterprises, which also have significant needs in terms of innovation and offer exciting potential for start-ups. Between the need to innovate and the fear of being "disrupted", companies are beginning to understand that the partnership route creates more value for them, in the long term, than purely and simply capturing the innovation produced by start-ups, or competing head-to-head with those which, having been spotted too late, are taking market share from them. All the hotel groups say today that they could have been in a "win-win" relationship with Airbnb if they had just explored in good time the possible synergies between the platform and their core business… Fortunately, highly constructive company/start-up partnerships are now emerging in all sectors. For example, by having incorporated a small, connected device, designed by a start-up, into its inhalers for asthmatics, a certain pharmaceutical laboratory is able to gain insight into its patients' habits (time of day when they use the inhaler, doses taken….) and enter into a direct relationship with them by offering them new services through a smartphone application. This partnership can even be seen as a "triple win": the laboratory gains customer insight to which its B2B2C model denied it access; the start-up has found a way onto the market which allows it to pursue its development; and the user of the connected inhaler benefits from an additional service. Another example, in mass-market retailing, this time: a certain retailer's experimentation with an innovative system of lasers that automatically analyze the contents of the shopping trolley is also a "triple win" partnership: validation of the technology for the start-up, time savings and greater comfort for the consumer, thanks to the complete automation of the checkout process; and for the retailer, enhanced efficiency and the elimination of fraud that was able to occur with other automatic till systems. All the start-ups we assist in the framework of the Keyrus Innovation Factory – in France, Israel, the United States – are open to collaborating with established companies, be they major groups or intermediate-sized enterprises. But not on any terms! The main condition is that their intentions/objectives and those of the companies in question must be in line with each other. This "strategic fit", in which the convergence of values is a major factor to be taken into account, is the essential condition for the success of a collaboration between a company and a start-up. • Time does not have the same value for a start-up as it does for complex organizations like a major international group. 6 months are an eternity for most start-ups. It is therefore necessary to speed up engagement processes, and this involves simplifying them. • Start-ups that have been in existence for only a year or two, or just a few months, even, are not materially able to satisfy the same criteria and requirements as classic suppliers/partners. It is therefore necessary to adapt and ease conditions for eligibility and the establishment of contractual arrangements and, if need be, help the startups acquire the certifications that are usually required. • The most promising start-ups are also the most courted. Since they have a choice, they will always turn to those companies which offer them not only the best terms for working together, but also the greatest potential to create value for them. 1 - Clarify the company's objectives – Faced with an ever increasing number of start-ups that are more and more sure of what they want, companies must, for their part, make it a priority to clarify and rank their reasons for wanting to work with young, innovative enterprises. This preliminary clarification is essential, since the objectives identified determine both the potential modes of collaboration, and the stage of development of those start-ups the companies can approach. If it is a matter of seeking inspiration for new offerings or finding new concepts, it is in the companies' interest to approach very young start-ups (seed) which, if they do not provide them with a tangible solution, will at least give a fresh perspective to the view those companies take of their market and their own customers. On the other hand, for medium-term co-R&D projects, a technological start-up which has already undertaken its first financing round will be a more appropriate partner. Alternatively, if the company is aiming for external growth, it will be more interested in start-ups which have already scored points in the target market. So as to avoid dissipating efforts and resources, the first stage for the company is therefore to situate itself in a matrix taking into account its short-, medium-, and longterm objectives and the stage of development of the target start-ups. Use case: For example, one of our insurance clients who wanted to launch a digital application sought out innovations with 2 distinct criteria for 2 different objectives. So it was that the client's requirement to digitally identify its customers by scanning their identity documents was sub-contracted to an advanced-level start-up, whilst its need for disruptive innovation, for its part, was met through joint Research & Development with a younger start-up. 2 – Mix intrapreneurs with start-ups – Being able to identify innovation needs/objectives, as well as startups and projects, does not guarantee that the innovation provided by the start-ups will be tightly integrated into the company. It is for this reason that we recommend to all companies joining the Keyrus Innovation Factory that they mix intrapreneurship with innovation "out of the box". It is a tried-and-tested way to compare points of view and create synergy between the solid knowledge which the businessfunction employees possess of the company, its customers and offerings, and the creativity that characterizes startups. The latter are, in fact, very keen to have this mentoring, as it speeds up their understanding of the problem issues facing the company. Moreover, giving salaried employees the possibility of pursuing entrepreneurial initiatives within the company, with the express support of management and working with start-ups, is also a terrific way to invigorate latent potential for innovation and, moreover, promotes the spread and entrenchment of a culture of innovation at all levels of the company. Use case: To meet the needs of a major bank, and as a first stage, we organized a hackathon for the employees so as to bring incremental innovations to light, thanks to those employees and the fact that they were the ones who knew the offerings and customers best. Then, in a second phase, we brought in start-ups, which gave a lift to the disruptive innovation. It was in this way, by coupling together intrapreneurship and start-ups, that the innovative creativity was made to be as rich and fruitful as possible. 3 – Proceed quickly to undertake pilots – Lastly, to achieve its innovation objectives, the company must very quickly proceed to undertake pilots with the identified start-ups. Experience shows that by undertaking three pilots per strategic topic identified, it is possible to test the capacity of the chosen start-ups and the projects to deliver concrete results. Depending on the expected return on investment, the company can compare the results and make an informed decision to proceed to a full-scale test with the partner/project that has obtained the best results. 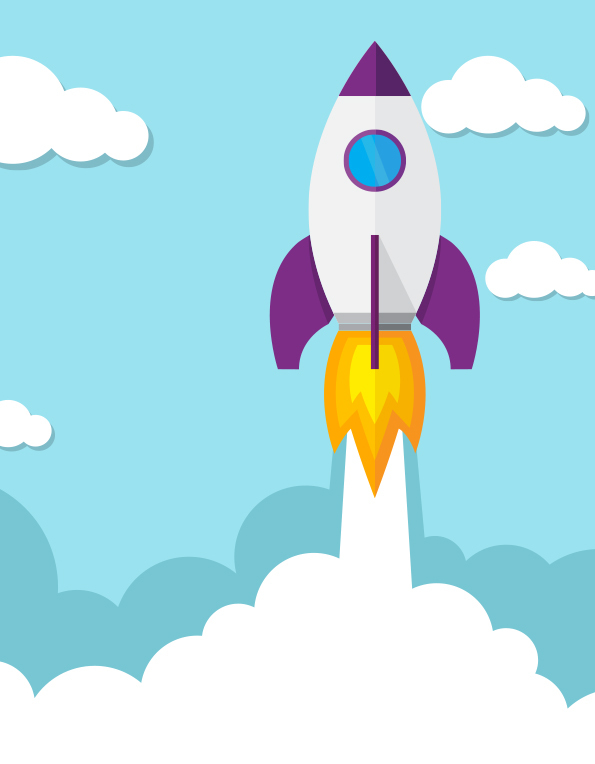 Use case: For example, one of our e-commerce clients opted for pragmatic innovation by forcing itself to test between 5 and 8 start-ups per year, so as to keep the teams constantly seeking excellence that served the interests of customers and promoted greater internal performance. These recommendations stem from Keyrus's long experience in working as much with start-ups as with companies in search of innovation. They form part of the principles implemented by the Keyrus Innovation Factory (KIF), which has made it its mission to accelerate innovation by creating a bridge between innovative startups and major European companies. KIF narrows the gap between these two ecosystems by helping start-ups to gain new markets, and companies to find innovative solutions capable of meeting the challenges associated with their transformation. Cyril Cohen-Solal is Vice President, Innovation at the Keyrus Group and runs the “Keyrus Innovation Factory” accelerator, a bridge program between startups and corporations. At the same time, he also acts as a mentor to many startups and is the coordinator of “French Tech Israel’’, the official hub of the French Tech ecosystem in Israel.” In addition, Cyril is an expert in high tech for the i24News tv channel and a correspondent for the FrenchWeb.fr website. 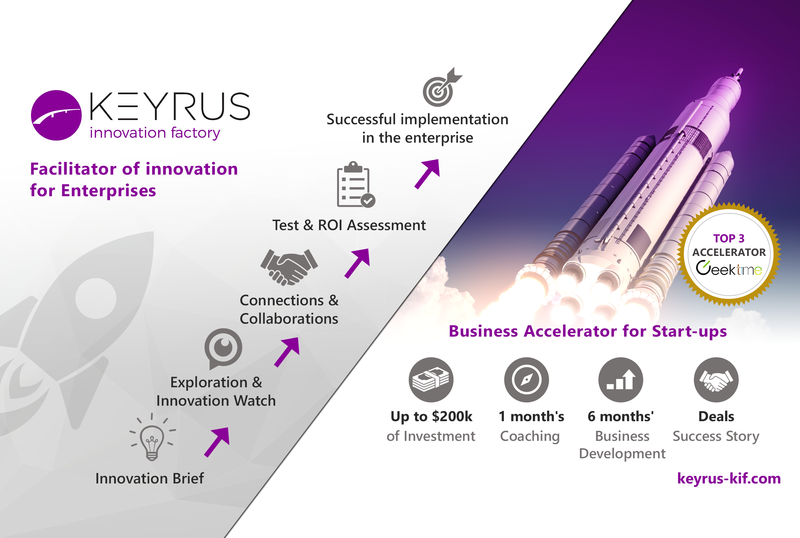 Present in France and Israel, Keyrus Innovation Factory (KIF) is the start-up accelerator of the Keyrus Group, an international company specialized in expertise in Data and Digital. > Major enterprises in their search for innovative technologies and implementation of new solutions. > Start-ups, through a 6-month program of coaching and networking during which they have the opportunity to propose their offerings to major groups. KIF also acts as a seed fund by making highly selective investments in start-ups that will enrich the Keyrus Group's portfolio of innovative solutions. Source : The State of Startup/Corporate Collaboration 2016, study undertaken by imaginatik and Masschallenge between 30/03/2016 and 24/04/2016 with 112 large companies and 233 startups. Source : How do the World’s Biggest Companies Deal with the Startup Revolution, INSEAD and 500 Startups, February 2016.